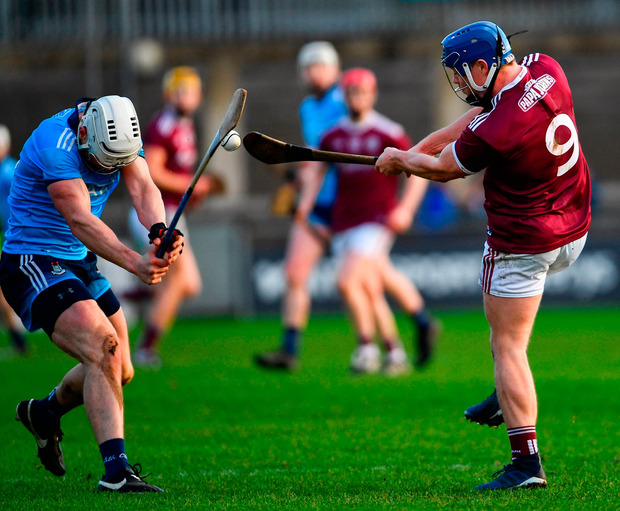 Galway edged out Dublin by a point yesterday in Parnell Park in a Walsh Cup semi-final that reserved its entire allocation of excitement for the final six minutes. The upshot is that Galway, granted access to this competition in 2009 but not equal venue rights, have to travel to Wexford next weekend for the final. "I'd be hoping that that's still not a foregone conclusion, that we might get a neutral venue," said Micheál Donoghue afterwards. 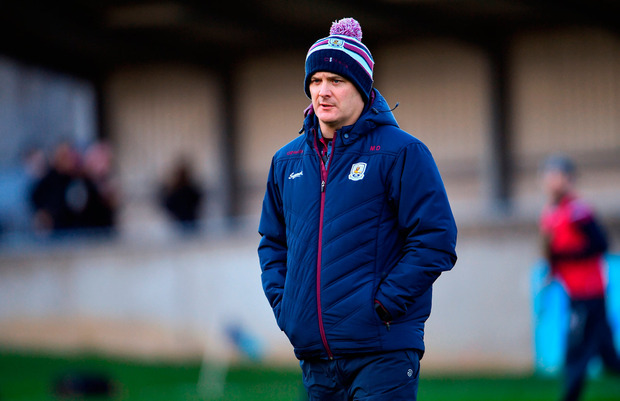 "Hopefully Leinster Council will look at that for us, that we get a neutral venue for the coming week because every team is at the same stage of preparation (for the league) and it's a big commitment to expect us to go down to Wexford next Sunday." The one-point defeat to his native county, thanks to a typically deft stroke of Joe Canning's hurley, was the least of Mattie Kenny's worries when he spoke afterwards. Some 24 of Dublin's currently bloated training panel will be involved in Fitzgibbon Cup action next Saturday and again the following Thursday, just 48 hours before Kenny's maiden league campaign begins against Carlow back in Parnell Park. "That's three games in six days," Kenny observed. "So the planners, this scheduling that the GAA is talking about, is gone horribly wrong again," he added, not unreasonably. "We have to manage that the week after next and try to get a team on the pitch against Carlow (in Dublin's Division 1B opener on January 26)." Though his team were demonstrably second best for 65 minutes of yesterday's game, particularly against the sublime Cathal Mannion who tortured Dublin from midfield and scored 0-10 (5f), they might conceivably have won. 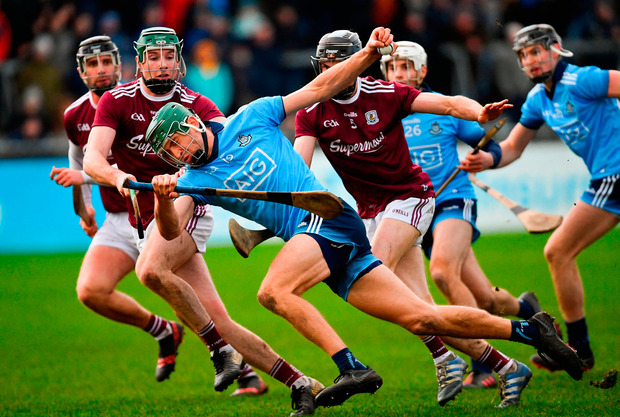 First, Dublin had a goal disallowed midway through the second half, when Donal Burke appeared to time his run towards Galway goal perfectly and flick a high, dropping John Hetherton delivery into the net. "It looked a legit goal," Kenny shrugged. Then Hetherton had a point comically ruled wide after it sailed almost directly over the black spot of the goal at the scoreboard end to which a stiff and direct wind blew. Finally, after Seán Moran's penalty brought Galway's lead back to within a point, Hetherton was felled on the run by Canning, who was booked. Hetherton's reaction cost Dublin a potentially equalising free and a full complement of players for the last four minutes after Paud O'Dwyer issued him with a red card for a blow roughly comparable with Canning's for severity. Minutes later, a free from Oisín O'Rorke levelled the game anyway, but Canning - a late addition to the Galway bench - struck a sideline sweetly over the bar three minutes into injury time to sign Galway up for a trip to Wexford they could apparently do without and leave Kenny to turn his focus to Dublin's Division 1B opener against Carlow. "It is his forte," Donoghue pointed out, "and obviously it was a massive execution of it. "We're well down," he added by way of appraisal of his current panel after fielding just five of last year's All-Ireland final team yesterday. "But obviously it gives lads massive opportunity that when they get the chance to go out and perform. "We have 30-plus lads training, they're really hungry, and we'll just look forward to next week." SCORERS - Galway: C Mannion 0-10 (5f), B Concannon 0-3 (1f), S Blehane, D Glennon (1f) 0-2 each, P Mannion, C Whelan, J Canning (sideline), A Harte 0-1 each. Dublin: J Hetherton 0-8 (8f), D Moran 1-0 (pen), C Crummey, D Burke, E Dillon, O O'Rorke (2f) 0-2 each, F Whitely 0-1. 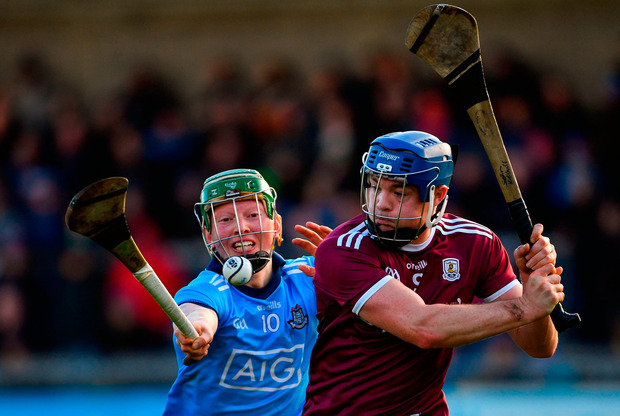 GALWAY - J Skehill; J Grealish, J Fitzpatrick, S Linnane; K Hussey, P Mannion, A Harte; S Kilduff, C Mannion; P Brehony, C Whelan, S Blehane; T Monaghan, B Concannon, D Glennon. Subs: S Loftus for Brehony (55) S Maloney for Kilduff (55), R Ó Meara for Glennon (62), J Canning for Blehane (67). DUBLIN - A Nolan; P Smyth, E O'Donnell, L Gannon; C Crummey, S Moran, S Barrett; T Connolly, R McBride; J Hetherton, F Whitely, F McGibb; E Dillon, L Rushe, D Burke. Subs: S Treacy for Smyth (h-t), D Gray for O'Donnell (47), C Conway for McBride (47), O O'Rorke for McGibb (51), D Keogh for Barrett (62), D O'Connell for Whitely (64), C Burke for D Burke (68).